Ohio fell to George Washington 77-49 on Monday in the first round of the Hawaiian Airlines Diamond Head Classic. The Bobcats’ 28-point loss was a result of dismal 25 percent second half shooting. George Washington (7-3) shot 47 percent from the field and benefitted from 15 offensive rebounds. The Colonials pulled away with a 12-0 run that put them up 20 points with just over six minutes remaining. Ryan Taylor led Ohio (3-5) with 13 points on five of nine shooting, but scored all of his points in the first half. The freshman was the lone Bobcat to reach double-digits in the loss. Ohio was outrebounded 44-28 by George Washington and turned the ball over 14 times. The Colonials held a 46-22 points in the paint advantage over Ohio. 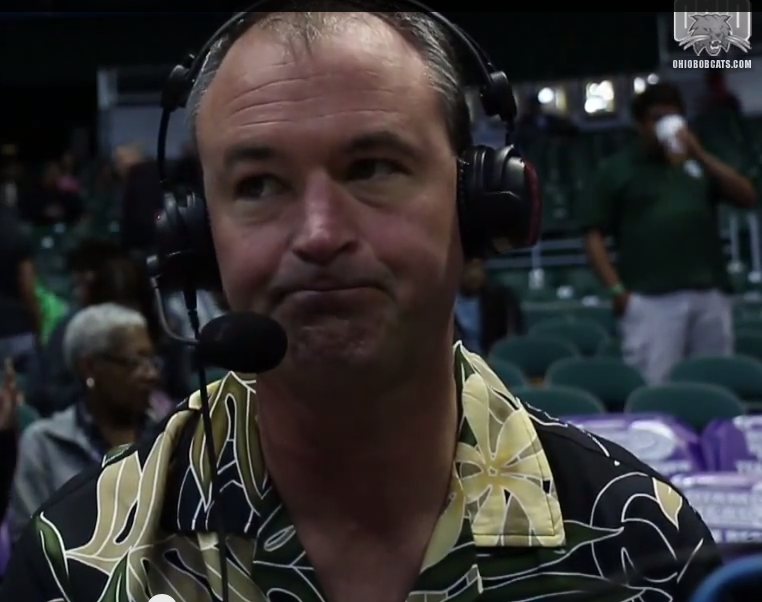 Saul Phillips is visibly upset after Ohio’s 28-point defeat, despite wearing a Tommy Bahama shirt. The Bobcats also failed to draw fouls and get to the free throw line. Ohio took just three foul shots; the Colonials shot 18. George Washington was led by Kevin Larson’s 19 point, 15 rebound double-double performance. The 6-foot-10 junior physically overpowered Ohio’s front line. The 28-point defeat was the worst loss for Ohio since a 58-point defeat to then No. 6 Kansas on Nov. 26, 2010. The Green & White will face Depaul (6-5) in the classic’s consolation game Tuesday at 2:30. Reblogged this on a. Corbin Bagford.